Today is hair chopping cutting day! I’m so excited to get my hair did 😀 It’s been almost a full year since I was last in the salon. Is that not ridiculous? I had the whole shebang done – cut, colour, highlights, blow out – a couple days before my cousin’s wedding, and right before my trip to Ecuador (gotta look good in the pics). Then I just kept letting it go, then I couldn’t decide what I wanted to do with it. Before I knew it, a year had past, and it’s not looking so hot. Hence why I never wear it down anymore, which really, is a shame. I’m not getting any colour this time though 😦 I’m trying to live on my “student budget” as much as possible, so it means just a cut, even though I would love to cover up those greys. But I’m still excited! Enough about my hair woes – time for breakfast! 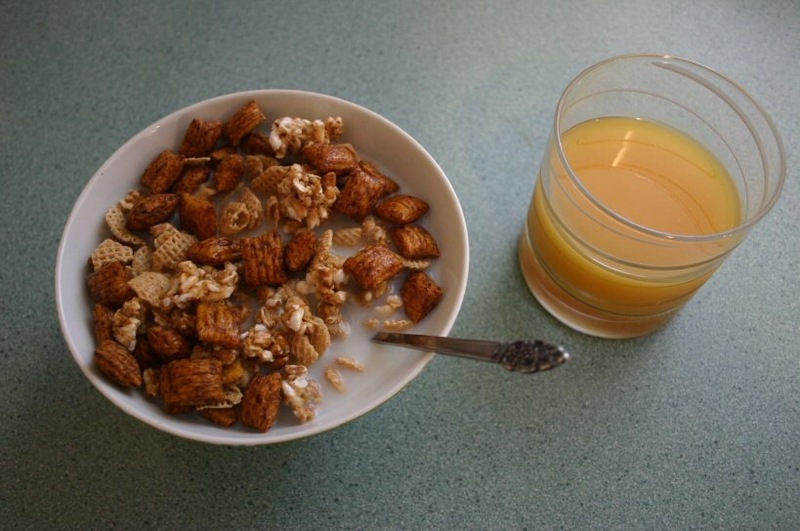 Good ol’ bowl of cereal – Kashi GoLean Crunch, Nature’s Path Heritage Bites, Cinnamon Puffins. With the mandatory glass of Happy Planet Mango Peach Party. Now I must create the lunch. It’s going to be a long day – hair cut after work, then off to a friend’s place for the evening. Enjoy your Thursday everyone! Have a great time at the salon. New hair cuts rock. You’ll have to post a pic of your new do!!! yes getting your hair done is the best thing ever!!! def post a pic of your new doo! Your bowls of cereal always make me crave a bowl. 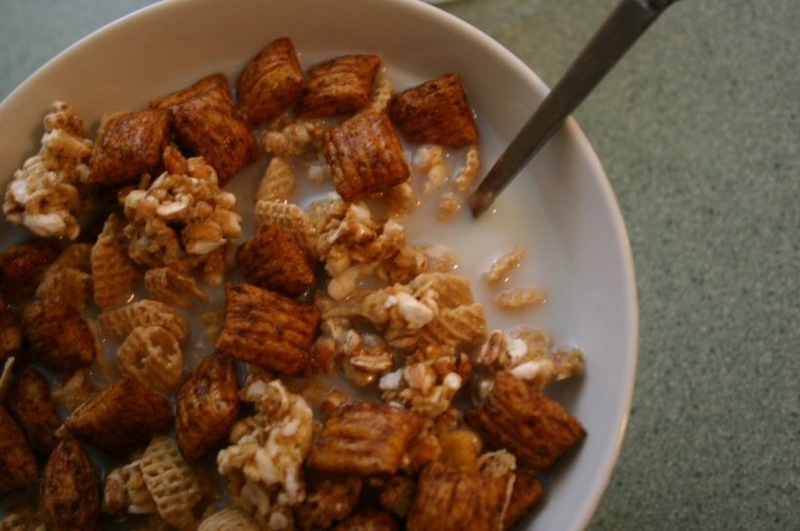 Kashi crunch, those bites, and cinnamon puffins are some of my fav. Ill have to start copying you every now and then! do you like the PB puffins? i’ve decided. the next cereal i buy is gonna be cinnamon puffins. period. Have fun getting your hair done! I want to see a pic of your new do! I just finished reading running with scissors. Ha! i wanna see the new do!!!! too bad we can’t. yark.